This Microtel Inn and Suites by Wyndham San Antonio North East puts you within easy reach of everything fun in sunny San Antonio. 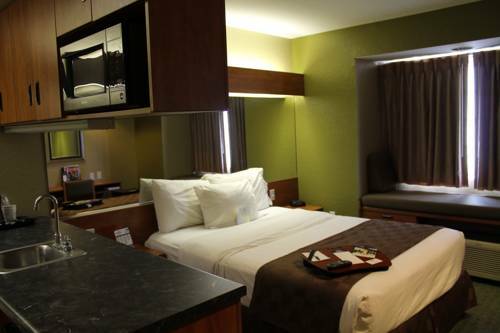 The ATT Center is half a mile away, and SeaWorld San Antonio, Splashtown, Six Flags Fiesta Texas and the San Antonio Zoo are all convenient to this hotel, as well as restaurants, downtown San Antonio and the Riverwalk. Brooke Army Medical Center and Fort Sam Houston Military Base are both less than a mile from this hotel. Enjoy a host of amenities including outdoor pool, fitness center, picnic area with grills, complimentary wireless Internet and complimentary breakfast, meeting rooms and large-vehicle parking. This hotel also offers a business center with fax and copy service. Modern guest rooms feature coffee/tea maker and complimentary local calls, and select rooms are available with microwave and refrigerator, ideal for longer stays.